1. Painter, T. S. (1933) A new method for the study of chromosome rearrangements and the plotting of chromosome maps. Science 78, 585-586. 2. Koch, E. A., Smith, P. A., and King, R. C. (1967) The division and differentiation of Drosophila cystocytes. J. Morphol. 121, 55-78. 3. Brown, E. H. and King, R. C. (1964) Studies on the events resulting in the formation of an egg chamber in Drosophila melanogaster. Growth 28, 41-81. 4. King, R. C. (1970) Ovarian Development in Drosophila melanogaster, Academic, New York. 5. Spradling, A. C. and Orr-Weaver, T. (1987) Regulation of DNA replication during Drosophila development. Annu. Rev. Genet. 21, 373-403. 6. Spradling, A. C. (1993) Developmental genetics of oogenesis, in The Development of Drosophila melanogaster, (Bate, M. and Martinez-Arias, A., eds. ), Cold Spring Harbor Laboratory Press, Plainview, NY, Vol. 1, pp. 1-70. 7. Mulligan, P. K. and Rasch, E. M. (1985) Determination of DNA content in the nurse and follicle cells from wild type and mutant Drosophila melanogaster by DNA-Feulgen cytophotometry. Histochemistry 82, 233-247. 8. King, R. C., Rubinson, A. C., and Smith, R .F. (1956) Oogenesis in adult Drosophila melanogaster. Growth 20, 121-157. 9. Dej, K. J. and Spradling, A. C. (1999) The endocycle controls nurse cell polytene chromosome structure during Drosophila oogenesis. Development 126, 293-303. 10. King, R. C., Burnett, R. C., and Staley, N. A. (1957) Oogenesis in adult Drosophila melanogaster. IV. Heredity ovarian tumors. Growth 21, 239-261. 11. King, R. C., Riley, S. F., Cassidy, J. D., White, P. E., and Paik, Y. K. (1981) Giant polytene chromosomes from the ovaries of a Drosophila mutant. Science 212, 441-443. 12. Keyes, L. N. and Spradling, A. C. (1997) The Drosophila gene fs(2)cup interacts with otu to define a cytoplasmic pathway required for the structure and function of germ-line chromosomes. Development 124, 1419-1431. 13. Storto, P. D. and King, R. C. (1988) Multiplicity of functions of the otu gene products during Drosophila oogenesis. Dev. Genet. 9, 91-120. 14. 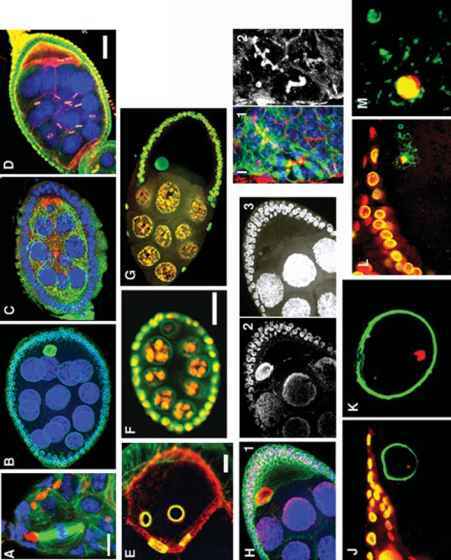 Rodesch, C., Pettus, J., and Nagoshi, R. N. (1997) The Drosophila ovarian tumor gene is required for the organization of actin filaments during multiple stages of oogenesis. Dev. Biol. 190, 153-164. 15. Glenn, L. E. and Searles, L. L. (2001) Distinct domains mediate the early and late functions of the Drosophila ovarian tumor proteins. Mech. Dev. 102, 181-191. 16. King, R. C. and Storto, P. D. (1988) The role of otu gene in Drosophila oogenesis. BioEssays 8, 18-24. 17. Storto, P. D. and King, R. C. (1987) Fertile heteroallelic combinations of mutant alleles of the otu locus of Drosophila melanogaster. Roux Arch. Dev. Biol. 196, 210-221. 18. Mal'ceva, N. I., Belyaeva, E. S., King, R. C., and Zhimulev, I. F. (1997) Nurse cell polytene chromosomes of Drosophila melanogaster otu mutants: morphological changes accompanying complementation and position effect variegation. Dev. Genet. 20, 163-174. Complementation between alleles at the ovarian tumor locus of Drosophila melanogaster. Dev. Genet. 7, 1-20. 20. Dabbs, C. K. and King, R. C. (1980) The differentiation of pseudonurse cells in the ovaries of fs231 females of Drosophila melanogaster Meigen (Diptera: Drosophilidae). Int. J. Insect Morph. Embryol. 9, 215-229. 21. King, R. C., Rasch, E. M., Riley, S. F., O'Grady, P. M., and Storto, P. D. (1985) Cytophotometric evidence for the transformation of oocytes into nurse cells in Drosophila melanogaster. Histochemistry 82, 131-134. 22. Heino, T.I. (1989) Polytene chromosomes from ovarian pseudonurse cells of the Drosophila melanogaster otu mutant. I. Photographic map of chromosome 3. Chromosoma 97, 363-373. 23. Rasch, E. M., King, R. C., and Rasch, R. W. (1984) Cytophotometric studies on cells from ovaries of otu mutants of Drosophila melanogaster. Histochemistry 81, 105-110. 24. Bishop, D. L. and King, R. C. (1984) An ultrastructural study of ovarian development in the otu7 mutant of Drosophila melanogaster. J. Cell Sci. 67, 87-119. 25. Heino, T. I. (1994) Polytene chromosomes from ovarian pseudonurse cells of the Drosophila melanogaster otu mutant. II. Photographic map of the X chromosome. Chromosoma 103, 4-15. 26. Zhimulev, I. F. (1996) Morphology and structure of polytene chromosomes. Adv. Genet. 34, 1-490. 27. Mal'ceva, N. I., Gyukovics, H., and Zhimulev, I. F. (1995) General characteristics of the polytene chromosomes from ovarian pseudonurse cells of the Droso-phila melanogaster otu11 and fs(2)B mutants. Chromosome Res. 3, 191-200. 28. Zhimulev, I. F. and Mal'ceva, N. I. (1997) Action of ecdysterone on salivary gland and nurse cell polytene chromosomes of Drosophila melanogaster otu mutant in vitro. Dros. Inform. Serv. 80, 77-82. 29. Heino, T. I., Lahti, V. P., Tirronen, M., and Roos, C. (1995) Polytene chromosomes show normal gene activity but some mRNAs are abnormally accumulated in the pseudonurse cell nuclei of Drosophila melanogaster otu mutants. Chromosoma 104, 44-55. 30. Perrin, L., Demakova, O., Fanti, L., et al. (1998) Dynamics of the sub-nuclear distribution of modulo and the regulation of position-effect variegation by nucleolus in Drosophila. J. Cell Sci. 111, 2753-2761. 31. Mal'ceva, N. I. and Zhimulev, I. F. (1993) Extent of polyteny in the pericentric heterochromatin of polytene chromosomes of pseudonurse cells of otu (ovarian tumor) mutants of Drosophila melanogaster. Mol. Gen. Genet. 240, 273-276. 32. Koryakov, D. E., Belyaeva, E. S., Alekseyenko, A. A., and Zhimulev, I. F. (1996) Alpha and beta heterochromatin in polytene chromosome 2 of Drosophila melanogaster. Chromosoma 105, 310-319. 33. Koryakov, D. E., Alekseyenko, A. A., and Zhimulev, I. F. (1999) Dynamic organization of the beta-heterochromatin in the Drosophila melanogaster polytene X chromosome. Mol. Gen. Genet. 260, 503-509. 34. Koryakov, D. E., Domanitskaya, E. V., Belyakin, S. N., and Zhimulev, I. F. (2003) Abnormal tissue-dependent polytenization of a block of chromosome 3 pericentric heterochromatin in Drosophila melanogaster. J. Cell. Sci. 116, 1035-1044. 35. Zhimulev, I. F. (1998) Polytene chromosomes, heterochromatin and position effect variegation. Adv. Genet. 37, 1-566. 36. Lindsley, D. L. and Zimm, G. G. (1992) The Genome o/Drosophila melanogaster, Academic, San Diego, CA. 37. Ashburner, M. (1989) Drosophila: A Laboratory Manual. Cold Spring Harbor Laboratory Press, Cold Spring Harbor, NY. 38. Clark, R. F., Wagner, C. R., Craig, C. A., and Elgin, S. C. (1991) Distribution of chromosomal proteins in polytene chromosomes of Drosophila. Methods Cell Biol. 35, 203-227.